Following dream two days for England hitting Aussies mostly with exceptional individual performances after Anderson, Cook, it was Kevin Pietersen's Day where he hammered his second double century on the third day of the 2nd Ashes test adding more miseries for Aussies.He scored with an excellent strike rate of almost 72 showing his class and flawless work done. Its been terrible run for Australian bowlers where since the first test they have got no clue of handling England's batting supremacy. But the show today had ended because of the downpour which someone has brought some break for nerve wrecking day at the field for Aussie bowlers, and yes for Ponting in specific. At this point Australia would be hoping to bring a draw out of the card somehow since till now with the 306 lead beyond them it would be an mission impossible for them. But here the issue would of declartion , it would be solely upto Strauss what would be going through his head. To me Pietersen would be allowed to pass his previous best of 226 , then there might be some declaration.But here the weather has been pretty uncertain , which would allow them to do some re-calculations. Seemingly the 551-4 itself is a great mental challenge for Aussies. They toiled hard in getting wickets , with getting a wicket each in every session.Cook was first to go where his patient 148 came to an end edging to Haddin off Harris, and Collingwood got out at 42 just after tea which was a kind of a mockery in comparison with heavy tons his other colleagues have been posting . 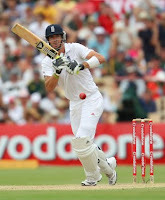 Cook in this Ashes had shown his class with his two centuries , but the surprise package was of Pietersen, his last century came in March 2009 against West Indies.. This would certainly would act as an anchor for the rest of the Ashes and with the elegance with which he displayed his utter mastery had made the Aussies bowlers frown with utter disbelieve. He kept on making gaps through the off side thumping the faster one with no remorse. Normally known for his weakness against left hand spin had no effect on him, did nothing rather tearing apart Doherty and messing with his stats where till tea he had stats of 0-120. So in short Aussies have had a pretty messed up day, with hardly making any impact or finding opportunities for themselves. When Cook got out he had 450 runs under his belt from his three innings, more than any of the Aussie batsman scoring in the entire 2009 Ashes edition. So what would we see today expectedly if rains clears, England declaring after Pietersen crossing his previous high score and see Watson coming out for a bat with his usual companion Katich attempting to save what would be horror of a defeat. Katich left the ground when he had aggravated with a heel problem. But he was not alone in this campaign where every one of the Aussies had to bite the dust.